Entertaining Food: Zeena, Warrior Princess? With a name like Zeena’s, you’d expect leather outfits complete with sorcerer staves and axes, macho men in scantily clad war vestments (yes, please! ), and ladies with bigger muscles than should be allowed in the natural world. Oddly enough, given the restaurant’s location is just off Capitol Hill, I’m sure you could find all of those things given the right parade. Maybe even in the same float if you’re really lucky. As for breakfast, all three of us (Chris, Ryan, and I) enjoy, well, love…breakfast. And brunch. But honestly, it really boils down to the bacon. We love bacon! Which usually means that regardless of whether we order eggs, sausage, biscuits, or pancakes, a side of bacon is never far behind. 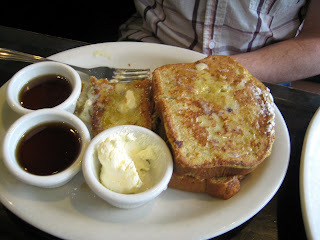 Fortunately, Zeena’s had a special: Banana Bread French Toast which made Chris’ day. Well, until he tried it. The half order was three slices (not sure who could complete a six-slice full order as the slices are big), but the bread doesn’t have nuts so it’s like a fluffy, cheaper version of the bread classic most everyone knows and loves. Of course, Chris ordered a side of bacon. Ryan decided he absolutely had to eat Pancakes, Eggs, and Bacon, so he ordered two large pancakes and I gave him one of my blueberry pancakes in hopes it would tide him over. 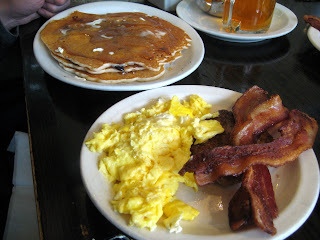 Along with his two scrambled eggs and large side of bacon, Ryan polished off his pancakes and decided the “average and mediocre” fare was filling, but thankfully inexpensive. 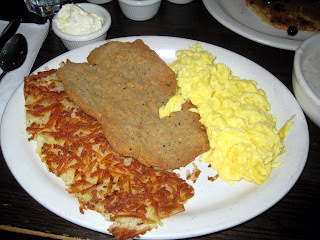 I had visions of grandeur when I ordered the Chicken Fried Steak because Geraldine’s is so amazing. However, the crust was too thick, the beef a bit chewy, and the runny sausage gravy used oddly jiggly sausage. I would not recommend this to anyone. 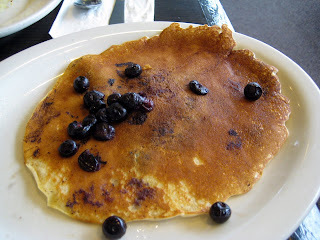 I would say the Bluebery Pancake I ate was pretty good, large and relatively fluffy, and there were a ton of "fresh" blueberries. I had expected some kind of canned pie filling compote on top instead of what were probably frozen but still held lots of blueberry flavor. 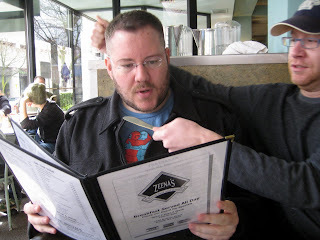 Overall, Zeena’s is probably best if you’re hungover as the fare’s greatly average and there are far tastier choices for about the same price range. And the coffee is see-through. Yeah, I don't get it either.